This complete slate veneer wall system helps the do-it-yourselfer achieve professional results. The FastStone+ wall system is manufactured from genuine slate with a self-adhesive backing. The unique FastStone+ design is what makes it both quick and easy to install. It can be installed over most existing solid wall surfaces including wood, dry wall, tile, painted surfaces and cabinetry. The perfect solution for backsplashes, walls, fireplace surrounds and many other applications. In virtually no time, you can transform your DIY project with beautiful, durable, long-lasting stone. 5 square feet, 5 pieces per pack. Package weight is 2.5 lbs. Buy online FastStone+ Copper 12 in. x 12 in. 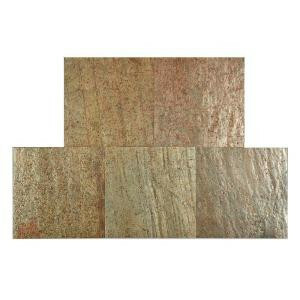 Slate Peel and Stick Wall Tile (5 sq. ft. / pack) 70-047-04-01, leave review and share Your friends.